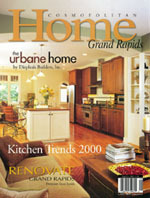 Interior design services for the featured home in Cosmopolitian Home magazine’s “The Urban Home” spread. The colors chosen throughout establish the inviting aura of warmth and friendliness that the homeowners wanted their new home to reflect. Light neutrals enlivened with warm browns, mossy greens and white wood trims go warm with touches of red and other muted hues. In the kitchen, Baltic brown granite surfaces the countertop areas and expansive island – perfect for gathering guests. The warm browns of the understated Shaker-styled walnut cabinets are repeated in the island’s butcher block, the leather seats of the wrought-iron barstools and across the way in the great room’s fieldstone fireplace. Underfoot, red birch flooring leads the eye through the open floor plan, from kitchen to great room to dining room and up the stairs to the second level. Christine DiMaria has focused mainly on new construction interior design with recently completed homes in Catamount, Darby Farms, The Preserve, Stonebridge, and The Sanctuary. 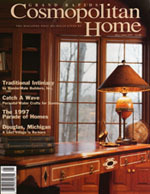 Interior design for featured home in Cosmopolitan Home magazine.